2013 Dodge Dart Pros and Cons: Why (Not) This Car? FIAT didn't have to pay a dime for its initial, controlling stake in Chrysler. Instead, the Italian company pledged to provide the bankrupt auto maker, hollowed out by Daimler and private equity firm Cerburus, with platforms and powertrains. 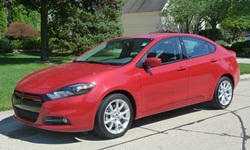 Three years later, dealers received the first car developed for North America around FIAT innards, the 2013 Dodge Dart. We've already put billions into the company. Why might we also consider buying the car? Some parts appear upscale and up-to-date, other parts not so much. 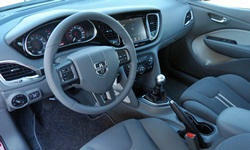 Why the 2013 Dodge Dart? Dodge's last small sedan, the Neon, was initially a hit due to perky styling and a low price. It was a bare bones car. You couldn't even get power windows in the rear doors, only the front ones. Cheap the Dart is not. A fully equipped Limited (the top trim level until the GT finally arrives; a planned R/T never happened) lists for over $28,000. Even without the optional engine, sunroof, xenon headlights, or 506-watt Alpine audio system, the tested car listed for over $25,000. When the Dodge Dart and Ford Focus are similarly loaded up, the Dart lists for about $275 more. For a car without a low price to be a good value, it must include a lot of stuff, and the Dart does. The tested car included a heated 10-way power driver seat (including four-way power lumbar), a heated steering wheel, reconfigurable LCD instruments, a sophisticated infotainment interface, nav, a rearview camera with guidelines, a blind-spot monitor, rear obstacle and cross-traffic detection, proximity key, automatic high beam headlamps, automatic wipers, and fancy lighting inside and out. Many of these features are available on no other similarly-priced compact sedan. The Focus comes closest. Even so, adjust for the Dart's additional features, and it ends up over $700 less than the Ford. A Buick Verano includes about as many features, but lists for over $3,000 more. Pony up for the Limited, and you get a seven-inch LCD between (and visually integrated with) an analog tach and fuel level gauge. This LCD can be configured to display the car's speed and trip computer information in a number of different ways. Aside from those infrequent times it's washed out by the sun, the display functions well and looks even better. An 8.4-inch display for Chrysler's Uconnect infotainment system fills the upper part of the center stack. With large, well-spaced, logically organized virtual buttons, this system is considerably easier and less distracting to use than the latest flagship systems from Ford and General Motors. You don't have to rely on the touchscreen or voice commands for basic audio and HVAC adjustments. Partly because they aren't needed for minor adjustments, the conventional knobs and buttons at the base of the center stack are refreshingly limited in number and easy to operate at a glance. Raked beltline and "Racetrack" tail lights (a $225 option) are sporty elements. Mostly looks good, works well. In sharp contrast to the Neon, noise levels inside the Dart are well below the segment average. Chrysler has even gone to the expense of fitting triple door seals. The Chevrolet Cruze and Ford Focus are about as quiet, though, while the Buick Verano is even quieter. Why Not the 2013 Dodge Dart? Perhaps owing to the Dart's FIAT underpinnings, even when the steering column is as low as it will go it's unusually high. Distant, too, even when telescoped all the way out. To compensate, I raised the driver seat, already a little higher than in a Focus or Cruze and higher than I'd personally prefer, at least another half-inch. This wouldn't be too bad, except that the seat--which lacks separate front and rear height adjustments--tilts forward as it is raised. Even with the seat raised, the view forward is restricted by a deep instrument panel and steeply raked windshield. (In my earlier, summer test drive these also made the interior hard to keep cool.) In the other direction, a rising beltline and high trunk make the case for mandatory rearview cameras. Sadly, these weaknesses are becoming the norm rather than the exception among compact sedans. The Dodge rides more smoothly over the small stuff than the more tightly damped Ford Focus. But larger bumps and potholes can register with such a loud, jarring crash that I half-expected a shock tower to punch through the hood. It's as if the ride quality engineers, when testing various scenarios, did well with most but missed a couple. The Buick Verano, more tightly and precisely damped than the Dart, but smoother than the Focus, might strike the best balance across the full array of road surfaces. Smooth as a bar of soap. Limited's body-color bumper avoids the over-sized grille look. About average rear seat space. Adults will fit, but without much room to spare. With its standard 2.0-liter four-cylinder engine and optional six-speed automatic transmission, the Dodge Dart earns EPA ratings of 24 mpg city, 34 highway. Recently redesigned or upgraded competitors, including the Ford Focus (27/38), Hyundai Elantra (28/38), Mazda3 (28/40), and Nissan Sentra (30/39) do at least a few mpg better. Once the Dart's engine warmed up, the trip computer typically reported 27 mpg in my suburban winter driving. With an extremely light foot and luck with the lights I could nudge the average over 30. The 274-horsepower Kia Optima SXL I'm testing this week does nearly as well. Perhaps because of its midsize sedan curb weight, the Dart gets midsize sedan fuel economy. Further evidence that excess poundage is the problem: the even heavier (3,300-pound) Buick Verano is even less economical (22/31). The front seats look great. But, partly because of how they're styled, they don't feel great. Thickly padded, slightly concave center panels are separated from widely-spaced bolsters by a deep, wide groove. With my average adult male build (5-9, 165 lbs. ), I didn't feel any support from the bolsters, only the slightly raised edges of the center panels and then the absence of support from the bordering groove. The front seats in the Ford Focus and Buick Verano are more comfortable and supportive. In the Dart's defense, it has the front shoulder room of a midsize sedan, partly justifying its heft. The interior also includes many places to store your stuff, including a compartment hidden beneath the cushion of the front passenger seat. Dodge's solution to the 2.0's fuel economy issues: an optional 1.4-liter turbocharged engine that's EPA rated 27/37 when paired with a six-speed dual-clutch automated manual transmission (DCT). The 1.4T is also quicker. Both engines have the same maximum output, but the 1.4T has a much plumper midrange (peak torque of 184 lb-ft at 2,500 rpm vs. 148 lb-ft at 4,600 rpm). But, before spending the extra $1,300, test drive the Dart with both engines. Last summer I drove a Dart 1.4T with a six-speed manual and found the engine soft below 3,000 rpm, sluggish to respond, and generally a poor match for a car that otherwise aspires to be luxurious. I haven't driven the 1.4T with the DCT, but other reviewers haven't been kind, criticizing it as clunky. The 2.0-liter engine might not be as quick as the 1.4T, but it is smoother and much more in keeping with the Dart Limited's character. Frankly, I didn't even mind its performance, the presence of this topic in the "why not" list notwithstanding. Yes, the Dart 2.0 can't get to 60 as quickly as most competitors. But it's not often necessary to get to 60 in well under 10 seconds, and the engine doesn't sound strained when hustled. It helps that the conventional six-speed automatic transmission responds promptly and shifts smoothly. Personally, I'd take the $1,300 and put it towards gas. Take an Alfa Romeo Guilietta hatchback, stretch it, widen it, add a trunk, and you somehow end up with a body that would have fit right into Dodge’s late 1990s lineup. The long nose and clean, organically flowing surfaces recall the Avenger coupe, with a hint of second-generation Neon. But the Dart's height is au courant, putting a lot more metal over the wheel openings. Even 17-inch wheels, once considered huge, appear undersized in some cases. Still, those who find the styling of Ford Focus and Hyundai Elantra overwrought will prefer the Dart’s simpler forms. Anyone expecting a compact sedan to appear basic (if not downright cheap) inside will be surprised by the Dodge Dart. Beyond the prominent LCDs, an accent light rings an upper instrument panel topped by an upholstered hood and the plush leather seats wouldn't appear out of place in a $40,000 luxury sedan. This said, the steering wheel buttons look and feel cheap and the interior's organic forms and non-flush lower center stack appear more 1990s than today. The quality of the parts inside a Buick Verano is more uniformly high. I personally prefer compact cars because their relatively small size and light weight can make them more fun to drive. In typical driving, the Dart delivers on this potential with a solid feel and precise responses. Push the Dodge hard, though, and its suspension can no longer disguise a midsize sedan-like 3,242-pound curb weight--about 300 over the Ford and Mazda (and about 500 over the Civic and Elantra). Steering feedback remains limited as the body rolls, the front end plows, and the suspension struggles to maintain a semblance of composure. The Ford Focus and Mazda3, with more communicative steering, more agile responses, tighter control over body motions, and better behavior when hustled along a badly paved road, remain the segment's top entertainers. So, why buy a Dodge Dart? If you're seeking a typically equipped compact sedan, it's hard to make a compelling case. The Dart's styling is clean, but dated. It's enjoyable to drive, but some competitors are quicker, more athletic, or both. Most are also more economical. But what if you are seeking premium features and a luxurious ambiance for well under $30,000, which rules out the Verano? Then the Dart comes out on top by offering features others do not. Sounds and feels better than other reviews led me to expect. But the EPA figures don't lie. Dart trunk space competitive, if not outstanding. Dodge provided an insured car for four days with a tank of gas. 2013 Dodge Dart pros and cons, according to Michael Karesh: the best reasons for buying (or not buying) the 2013 Dodge Dart. Join TrueDelta to post your own impressions.